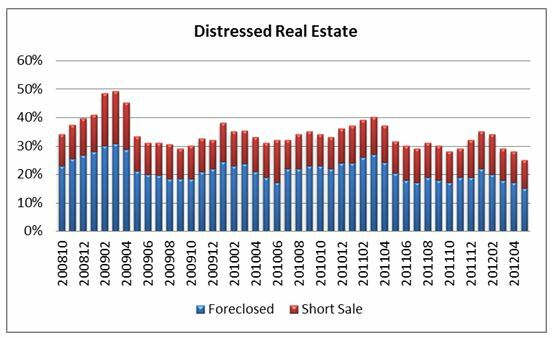 Distressed declined to 25 percent of total sales according to the May Realtors® Confidence Index. About 44 percent of distressed sales were for cash over the past year. Distressed sales go through several stages—the initial overdue status for mortgage payments, the actual foreclosure by the financial institution unless sold in a short sale, and the final sale of the property, frequently by Realtors® through the MLS. Currently Realtors® in a number of markets are reporting shortages of inventories of distressed real estate: the markets are clearing distressed properties from the market at a rapid rate. The Existing Home Sales market is bifurcated, with distressed properties frequently being sold at significant discounts to market, frequently in subpar condition when going to market, and reported to be popular with investors seeking bargain prices. Investors pay cash in 69 percent of their overall purchases of properties (both distressed and non-distressed), in comparison to first-time buyers who overall pay cash in 11 percent of their purchases. In the case of distressed properties with a seller who would like to close a transaction without waiting for the buyer to obtain a mortgage, an investor may be a preferable buyer. We have received many reports of investors obtaining a property even when a first-time prospective buyer has offered a higher price.